Not to be confused with Latin American Canadians. Spanish Canadians (Spanish: Español-Canadienses; French: Canadiens Espagnols) are Canadians of full or partial Spanish heritage or people who hold a European Union citizenship from Spain as well as one from Canada. The laws in Spain (see Spanish nationality law) limit who may be granted Spanish citizenship from Latin America to parents and grandparents who once held Spanish citizenship. More recently the legal system in Spain has granted citizenship to Cubans who can prove that their grandparents immigrated to Cuba during the Spanish Civil War (see Law of Historical Memory). Spaniards are found in all areas of the city of Montreal as well as in suburbs such as Dollard-des-Ormeaux, Laval, Brossard and Greenfield Park. There is no "Spanish quartier", but Montreal’s Rue Saint-Laurent is home to Spanish associations, which should not be confused with Latin American Associations, as well as to the Librería Española. The present day Canadian Spanish population did not appear in Ontario and Quebec until the mid 20th century and have not really had a profound impact in developing or promoting their language and culture, unlike the Spanish Speaking Latin American Canadian community. This in part is due to the fact that the Spanish population in Canada is almost insignificant in comparison to the Spanish speaking Latin American Canadian community. As a rule of thumb, the second generation Spanish Canadians seem to have become indifferent or have lost interest in having any ties to Spain and have easily been absorbed into the anglophone or francophone Canadian culture. Vasco Núñez de Balboa was the first European to take possession of the Pacific Ocean and adjoining lands for Spain. 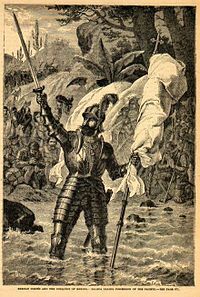 Later the Spanish conquistador and explorer Vasco Núñez de Balboa became the first European to see and stand in the waters of the eastern shore of the Pacific Ocean. He accomplished this feat after an arduous trek through the jungles of what is now Panama. Once there Balboa with raised hands, his sword in one and a standard with the image of the Virgin Mary in the other, he walked knee-deep into Ocean, and claimed possession of the Pacific Ocean and all adjoining lands (which included British Columbia) for Spain in the name of his Spanish sovereigns on September 13, 1513. Then a Greek born Spanish explorer Juan de Fuca in the service of the king of Spain, Philip II, explored the Strait of Anián in 1592, now known as the Strait of Juan de Fuca, between Vancouver Island, now part of British Columbia, Canada, and northwestern Washington state, United States. People from northwestern Spain known as Basques have been landing in Newfoundland since the late 14th century to dry their cod fish, which they caught in the Grand Banks of Newfoundland. By 1578 Anthony Parkhurst, a merchant, explorer, and advocate of English settlement in Newfoundland, was able to count over 100 Spanish vessels at Newfoundland, all seeking cod. In contrast, the level of English activity during this period was quite small - Parkhurst claimed that in 1573 there were only four English vessels at Newfoundland. Starting in the mid-18th century, Spain's claim began to be challenged in the form of British and Russian fur trading and colonization. King Charles III of Spain and his successors sent a number of expeditions to present-day Canada and Alaska between 1774 and 1793, to counter the threat of Russian and British colonizers and to strengthen the Spanish claim. During this period of history it was important for a nation's claims to be backed up by exploration and the "first European discovery" of particular places. Since Spain was busy colonizing Latin America, Canada was ignored until the 18th century when Spain made an effort to explore and set up forts in British Columbia. While it is thought that Sir Francis Drake may have explored the British Columbian coast in 1579, it was Juan Pérez who completed the first documented voyage, which took place in 1774. Juan Francisco de la Bodega y Quadra explored the coast in 1775. In doing so, Pérez and de la Bodega reasserted the Spanish claim for the Pacific coast, first made by Vasco Núñez de Balboa in 1513. 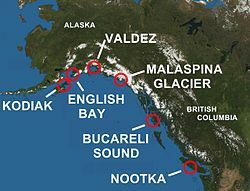 A major war between Spain and Britain over British Columbia could have begun via the Nootka Sound dispute in 1789. Spain at the time sent José Martínez to occupy Nootka Sound and establish exclusive Spanish sovereignty. During the summer of 1789 a number of fur trading vessels, British and American, arrived at Nootka. A conflict over sovereignty arose between the captain of the British Argonaut, James Colnett, and Martínez. By the end of the summer Martínez had arrested Colnett, seized several British ships, and arrested their crews. Colnett had come to Nootka Sound intending to build a permanent trading post and colony on land previously acquired by his business associate John Meares. At the end of the summer Martínez abandoned Nootka and took the captured ships and prisoners to San Blas, New Spain. The news about these events triggered a confrontation between Spain and Britain known as the Nootka Crisis which nearly led to war. A major war over British Columbia with the British was peacefully resolved via the Nootka Convention, with both parties retaining their claims until a future solution could be finalized. In the early 19th century, Spain was weakened due to the Napoleonic Wars and the Spanish American Wars of Independence it had to fight in South America against Simon Bolivar and San Martin. Eventually, Spain felt that in its weakened state it might lose its North American territories to Britain. 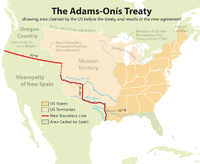 As a result of this, Spain decided to transfer its claims to parts of North America to its old ally United States during the American Revolution through the Adams-Onis Treaty of 1819. In exchange, the U.S. promised to pay U.S. residents claims against the Spanish government totaling $5,000,000. Consequently, the United States of America has used its inherited Spanish rights to support its claims to the Oregon country which consisted of the Oregon Territory and British Columbia during the Oregon boundary dispute with Britain. ^ "Ethnocultural Portrait of Canada Highlight Tables (2006 Census)". Statistics Canada. Retrieved 2009-06-21. This page was last edited on 29 January 2019, at 17:02 (UTC).